Dear Penny. This morning she was not on the roost. I thought it was odd, but she's an independent chica, bottom of the pecking order, but not too concerned because she's happy on her own. But when I returned this afternoon, saw her in the same spot, hunkered down, feathers ruffled... I knew she was in a bad way. She made no fuss when I carried her out of the cottage. The first thing I did was bring her some water. She sure was thirsty. She took small sips, and plenty of them. The next thing I did was to create a fenced off space where she could be close to her own food and water, and not get harassed by Kamen, Debbie, or Shebot. I watched her. She's not well. 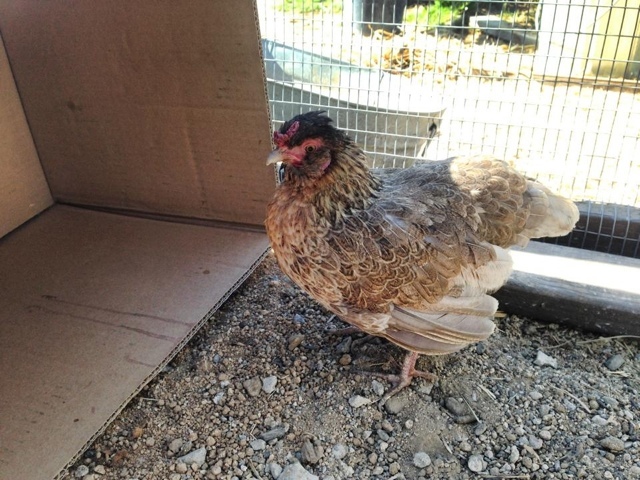 Chicken health is mostly rudimentary, but it's also mysterious. From first hand experience, and other farmers, I've learned that chicken experts are rare, few and far between, and much of what can be figured out is discovered after the fact. I love my chicas, but I understand that they will not live forever. Of course, while they're here I do try to give them what I can, make them comfortable. And I'm always learning new remedies... Many thanks to bloggers, like HenCam, who share what they've learned, too. This seemed like the time to try Terry's Spa Treatment. 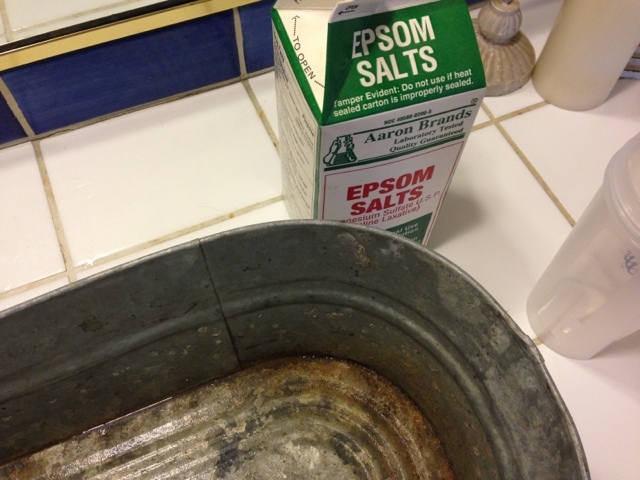 Warm water and about a quarter cup of Epsom salts. A chicken bath? 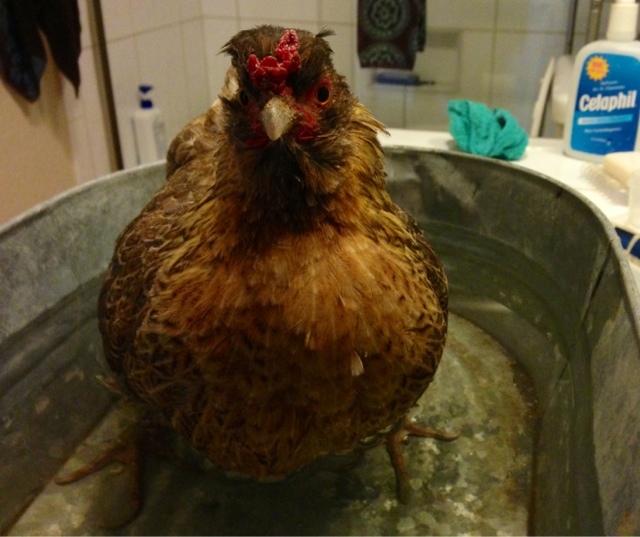 Yes, a relaxing, soothing chicken bath. There's no call for sharing a video clip,because she was as quiet and still as this photograph. I've seen other chickens, other images, but this first hand experiment was something to behold. She enjoyed her bath. 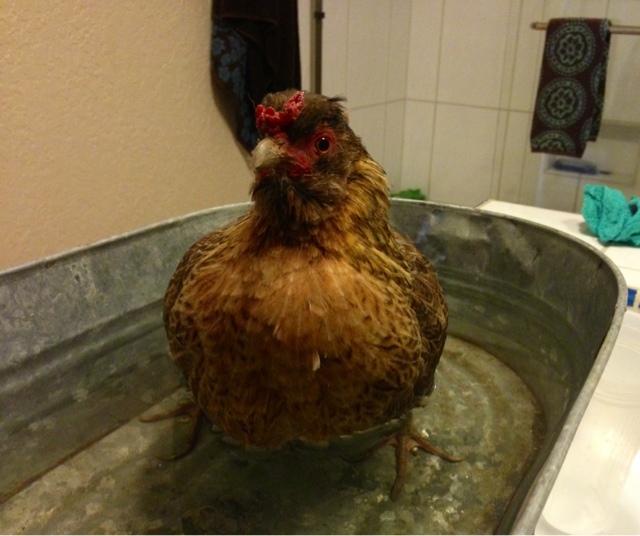 So, maybe a chicken bath is nothing new, no biggie... But what about the rest of her treatment? Would you believe... A blow dry?! around, always checking the heat. She never peeped. She never squawked. 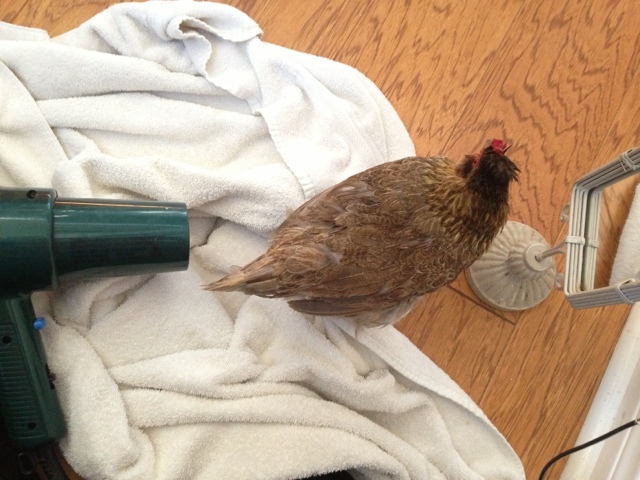 She just settled in til she was dry and fluffed. I'm glad the spa treatment was so well received. She's back in her private retreat, but... sigh... She's not well. Her wings are low, she looks detached, maybe she's meditating. We will monitor her, try to keep her comfortable. Hopefully she'll rally, and we can enjoy more days observing her sweet ways. I hope all goes well. I had a scare with my little Lucy about two weeks ago. I opened a can of cat food after reading a blog about it. 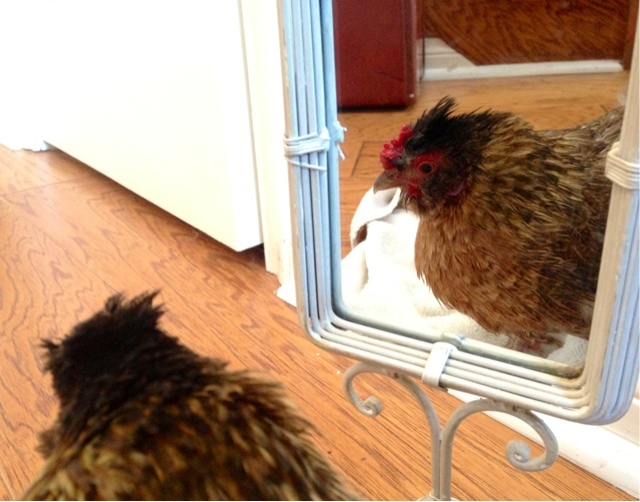 It perked her right back up again, but then, like you say, you never know with chickies. Now I can't remember the name of the blog. But I do get a lot of chicken knowledge from Fresh Eggs Daily. You might want to check her out. Blessings to Penny!! Sending good thoughts to Penny and the Vans. Look over at Tilly's Nest Blog. She posts lost of treatment info. Aw, Penny. I'm sorry she's feeling crummy. But so glad you're keeping her as comfortable as possible, and glad that you understand that we can never be sure what's going on in those little chicken bodies.